The challenge of reforming economics cannot be overstated. Modern mainstream economics has remained dominant in our universities and governments despite overwhelming evidence against most of its core principles, and despite decades of attempted revolutions. The concept of a static equilibrium and the ‘representative agent’ method of aggregation are just two notions that have been repeatedly shown to be internally inconsistent; not just by outsiders, but by many of the leaders in the mainstream. Yet they continue to dominate the discipline. Outdated and economically irrelevant concepts still fill the pages of introductory textbooks. From there they fill the minds of each new generation of students, who pass on these ideas to the next generation of students, and across society more broadly. Breaking the feed- backs in this system is necessary to transform the discipline. The call for pluralism is admirable. Pluralism is a goal upon which most reformers agree. But my view is that previous attempts at reforming economics have failed because they avoided, or inadequately understood, two main barriers to change. While they may at first seem insurmountable, without leveraging change at these points, the mainstream will stay locked in as the dominant approach to economic analysis. The first main barrier is social. Economics as a discipline typically rewards tribalism over reconciliation. If you’ve been following economics blogs in recent years you may have a pretty clear understanding of this. But the same dynamic happens in academia. Journals enforce their preferred methods and concepts and act as the gatekeepers to the tribe, requiring all comers to offer sacrifices to tribal elders. Moreover, the mainstream represents over 80% of the discipline, so any change promoted by minority groups will be frowned on. This is the social reality. The second main barrier is technical. The technical problem is: How do you teach a pluralist program when there is no recognised structure for presenting content from divergent and often contradictory schools of thought, and when very few academics are themselves sufficiently trained to do so? Teaching a pluralist curriculum should not be about presenting the economics discipline as one of feuding tribes. I share Simon Wren-Lewis's fear that a pluralist curriculum could become a one-stop shop for students, who get to browse the tribes before joining the one that most aligns with their existing political ideology. Instead, the object should be to train a generation of economists to be aware of the legacy of each school of thought, and acknowledge the common ground between them. There is an old saying that if you ask five economists a question, you will get five different answers – six if one went to Harvard. Can we teach a pluralist curriculum which would bring economists onto the same page, so that when you ask five economists a question, you get one good answer? The problem needs a systematic solution. For example, we need to think about how to structure teaching around topics and concepts that allow students to study problems and evaluate potential approaches. We need an alternative textbook, or set of them, that can satisfyingly demonstrate each approach and ultimately offer a foundation for a pluralist curriculum. "… ten of the 25 textbooks examined make no reference at all to behavioral economics; six dedicate less than 1% of total pages to it, six between 1% and 2.6%, and three between 6% and 11%. When behavioral economics is discussed, the focus tends to be on bounded rationality rather than on bounded self-interest or bounded willpower. "Experimental economics is not discussed at all in ten textbooks, twelve textbooks dedicate less than 0.6% of total pages to it, while three dedicate between 2% and 10% of total pages." Joan Robinson tried to comprehensively rewrite the core introductory economics textbook with John Eatwell in 1973. While the book does a superb job of putting economic analysis in a philosophical and historical context, it offers no coherent backbone upon which to build an understanding of economics. It contains very little to aid the student in answering practical day-to-day questions about the economy. Where does money come from? How do we measure unemployment? How could we assess alternative options for addressing negative externalities? Is the very concept of externality useful, since it implies the existence of a no-externality world? What is needed is a way to structure the exploration of economic analysis by arranging economic problems around some core domains. Approaches from various schools of thought can be brought into the analysis where appropriate, with the common ground and links between them highlighted. In my view achieving this requires mapping models and ideas onto conceptual domains that transcend specific schools of thought. Any economic topic can then be presented as a general problem, such as, “Why do firms exist?” or “Why do we care about the allocation of resources?” But the discussions will be structured into broadly applicable domains. To illustrate, consider this diagram. The lower two levels (marked in yellow) are the two domains of current mainstream economics. The links between the domains and the limitations of each in explaining the whole need to be explored, and I hope to develop this concept in future pieces. Unless the community of economic reformers can make the effort to reconstruct the way economic is taught, and make the tough decisions about how to structure new core texts, including what to leave in and what to leave out, then change will remain elusive. We can’t call for change in the tribal social environment of economics without offering an attractive alternative – one that embraces the best from each of the schools of thought and finds common ground without creating a new set of outsiders. Policy Research in Macroeconomics, led by Ann Pettifor. Excellent recent piece: "Secular Stagnation Is the Result of Deliberate Policy"
Post-Crash Economics Society: Students taking the initiative at Manchester University. Rethinking Economics: Broad-based center for organizing. The fortnightly newsletter is packed. Cambridge Society for Economic Pluralism: Student led, insisting on pluralism, download the "Is it Time for Change at Cambridge?" report. Post-Keynesian Economics Study Group. Serious work from serious Post-Keynesian economists. New Economics Foundation: Think tank based on the mission "Economics as if people and the planet mattered." Home of the Green New Deal. 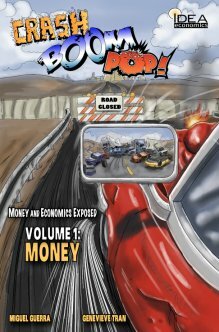 Support economics in a graphic novel medium, not dumbed down, but entertaining, illustrated and relevant. 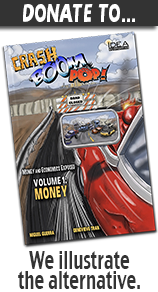 Crash, Boom, Pop! Money and Economics Exposed.